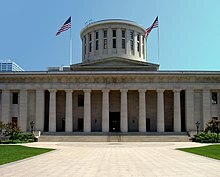 The One Hundred Thirty-first Ohio General Assembly was a meeting of the Ohio state legislature, composed of the Ohio State Senate and the Ohio House of Representatives. It convened in Columbus, Ohio on January 5, 2015 and is scheduled to adjourn January 2, 2017. The apportionment of legislative districts is based on the 2010 United States Census and 2011 redistricting plan. Both the Ohio Senate and Ohio House of Representatives were retained by the Ohio Republican Party. ^ "GOP Ohio senators re-elect Faber as president". Akron Beacon Journal. Akron. November 12, 2014. Retrieved November 26, 2014. ^ "GOP maintains leadership team in Ohio Senate". Dayton Daily News. Dayton. November 12, 2014. Retrieved November 26, 2014. ^ "GOP Ohio senators re-elect Faber as president". WFMJ. Youngstown, OH. November 12, 2014. Retrieved November 26, 2014. ^ "Faber re-elected as Senate president". Daily Advocate. Greenville, OH. November 12, 2014. Archived from the original on December 5, 2014. Retrieved November 26, 2014. ^ "Ohio Senate Democrats keep current leadership in place". Cleveland Plain Dealer. Cleveland. November 19, 2014. Retrieved November 26, 2014. ^ "From Wright State to House Speaker". Dayton Daily News. Dayton, Ohio. November 25, 2014. Retrieved November 26, 2014. ^ "Minority Leadership". The Ohio House of Representatives. Retrieved March 2, 2016. This page was last edited on 15 April 2019, at 11:15 (UTC).